ASUCD hosted an impromptu open forum in the CoHo on Jan. 22 in response to the backlash that followed a Facebook post from ASUCD’s Ethnic and Cultural Affairs Commission (ECAC). The post, which gained national attention, criticized Davis students and community members for using a photograph of slain Davis Police Officer Natalie Corona with the “Thin Blue Line” flag to honor her. The forum allowed the community to discuss the heightened attention drawn to the “Blue Lives Matter” movement and flag, as well as unpassed ASUCD legislation recognizing Corona’s death. The ECAC’s now-deleted post referred to the flag “anti-Black and disrespectful,” highlighting the commission’s belief that police presence may be triggering for certain individuals. ASUCD President Michael Gofman quickly countered this with a post of his own. “I wholeheartedly condemn the Ethnic and Cultural Affairs commission for this disgusting post, and urge them to take it down and issue an apology,” Gofman wrote in the post. Gofman’s post sparked further controversy and incited more than 1,300 comments, which included threats of violence and offensive language. Throughout the forum, Gofman was repeatedly asked to take the post down and condemn the disrespectful language in the comments section. He publicly committed to authoring a post condemning the hateful words on Facebook that same night. A post was subsequently published the next morning. Prior to the public forum, the Senate tried to pass a piece of legislation to honor Corona during a special session meeting on Friday, Jan. 18. This resulted in further discourse among the public, with several individuals feeling that if ASUCD was drafting a resolution to honor the death of a policewoman, they should draft resolutions for every victim of a tragic death. The open forum sought to resolve these issues and provide a space for the public to voice their opinions. Around 100 individuals attended, filling up the entire southwest wing of the Coffee House. Before beginning, ASUCD Vice President Shaniah Branson reminded the crowd of the UC Davis community agreements and requested that individuals form lines in front of designated microphones when making their questions and comments — an effort apparently made in vain, for a majority of participants opted to yell their concerns from the crowd. The first figure, who kicked the meeting off with complaints directed at Gofman, was KateMarie Bocconi, the vice chair of the Young Democratic Socialists of America Club. She expressed her discomfort over the police presence outside of the CoHo — which was unrelated to the forum — and accused ASUCD of failing to create a safe environment for people of color to express their opinions, stating that the Senate did nothing to mediate the harm that Gofman allegedly caused the ECAC. This inquiry echoed many of the concerns that other audience members had, as each time Bocconi made a statement, she was greeted with clapping and cheering. She ended her address by asking the Senate to remove Gofman as president, a plea that evoked verbal support from the crowd. Concerns over the resolution to honor Corona did not stop there, for many other community members stood up in the crowd during the forum, shouting out grievances. Shreya Deshpande, a fourth-year sociology major and a member of the ECAC, opted to wait in line to formally direct a question to the Senate. Deshpande, along with others who voiced their support for her, felt that the resolution did not represent the sentiment of the entire student body. Mohammad Qayum, a co-author of the resolution, said he was more than willing to open up a dialogue over the revision of the legislation. Two days after the forum, Qayum was sworn in as an interim senator. Additional concerns, such as ASUCD’s choice to hold a forum after the resolution was drafted instead of before, were also articulated. Others felt that the Senate was using Corona’s death as a political tool, and that Gofman’s reaction to the ECAC’s post was a method to delegitimize the commission. It had been speculated both previously and in the forum that Gofman’s beliefs and those of the ECAC do not perfectly align. One speaker at the forum said that Gofman used his “whiteness” to hurt others, and that his “frat brothers” bearing “white supremacist symbols” in the front row were the only reason he got elected. Discussions surrounding Gofman’s stance on the Israeli-Palestinian conflict and his alleged support — or lack thereof — for transgender individuals was also brought up. At one point, ECAC Chair Rina Singh opened up about the threats she and her commission faced after the commission released its statement about the Blue Lives Matter flag, which she called “a racist flag,” online following Corona’s death. Singh read from a prepared statement, announcing that the committee strongly stands by its Facebook post — “we do not apologize for it,” she said. In her off-script speech, Singh attempted to call Gofman out for this post and asked him, “Why do you lie?” She failed to mention that she had previously apologized for this event, saying the commission should have done a better job reaching out to Jewish students beforehand. Toward the end of the forum, one speaker voiced his feeling that passing a resolution for a fallen police officer felt unfair, especially when taking into account the thousands killed by police brutality. 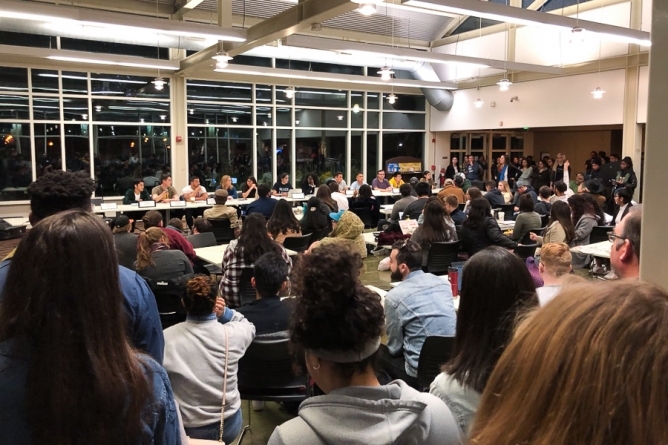 The individual argued that ASUCD had never made statements regarding police violence and how it affects different groups within the UC Davis community. ASUCD Senators were then encouraged to “read the readings” to gain perspective on the narratives that black and brown individuals experience daily. All of them agreed to do so, save for Michael Gofman who had already departed for a class he had at 6 p.m.
ASUCD Vice President Shaniah Branson concluded the open forum around 7 p.m., thanked all attendants for coming out and stated that if community members wanted directions on how to impeach Gofman, they should approach her after the meeting.